When cooking for yourself, the freezer is your friend. I don’t tend to freeze portions of things once I’ve prepared them. I know lots of people swear by this and someday I might get into it. For now, I like to freeze ingredients that I don’t use quickly enough to store them in the refrigerator. Bacon is one of those foods. I’ve heard of freezing individual portions of bacon, but that feels like a fussy way to add packaging. I plan to thaw the bacon block before I need it, though inevitably I’m ready to use it and haven’t thought ahead. Tonight I sliced the frozen slab crosswise at the short end and had just the right chop for this dish. My new and improved method. The polenta to water ratio in this recipe was supposed to serve one, maybe that one isn’t a five foot tall woman. I had a happy solution; making use of the mini Fire King baking dish I picked up at a consignment store last weekend. I imagined it with a tiny fruit crisp or a baked egg, but polenta it is. They’re a perfect match! In a small saucepan, bring water, polenta and salt to a boil over medium heat. Whisk from time to time so lumps don’t form. 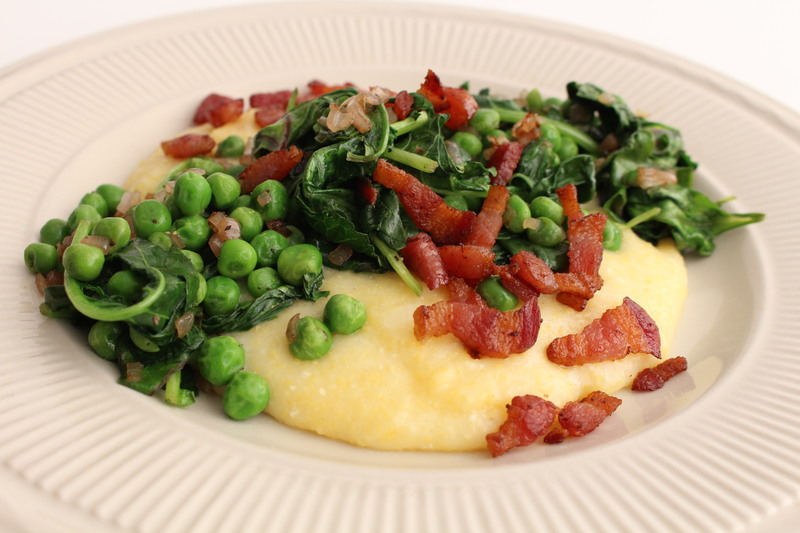 Cook until polenta has a thick, smooth texture. Add cheese and butter and whisk until combined. Spoon onto your plate, it will continue to firm up as it cools. Brown bacon in saute pan on medium heat. Remove from pan and aside. Add shallot to bacon fat and cook until soft. Toss in the greens and then the peas once they have wilted. Season to taste. You may not need much salt due to the bacon. 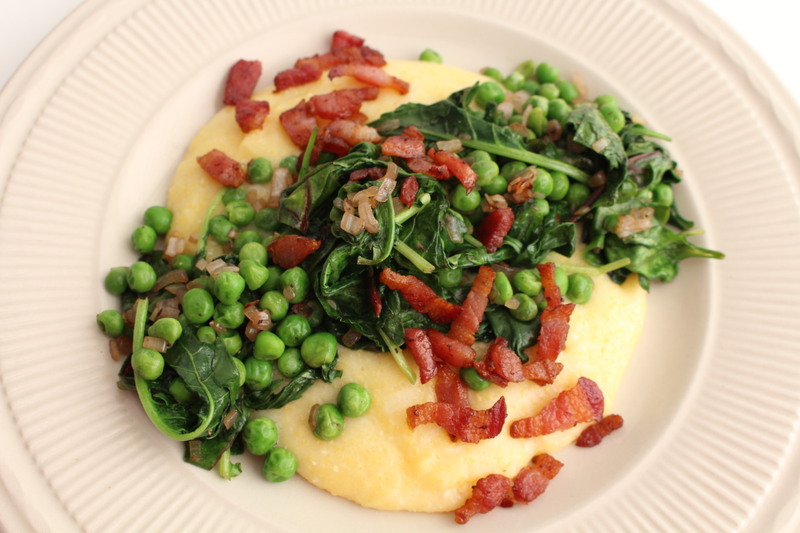 Top polenta with the greens and peas. Garnish with bacon. Dig in!